Admission includes unlimited rides, shows, and attractions — including visits with Santa and his reindeer, the water park in season, the Elfabet scavenger hunt, and a ring from the blacksmith — plus use of a stroller, and parking. To purchase 2019 Tickets online now, click here. We believe everyone deserves the best rate. Our simple everyday pricing is listed below — no need to search for coupons or promo codes, there are none out there. We JOYfully accept Visa, MasterCard, and Discover credit cards, US currency, Canadian currency at current exchange rates, and Traveler’s Checks. Children ages 1, 2, and 3 Free! Memorial Day Weekend through August 10: your “Return Pass” is valid through Sunday of Columbus Day Weekend, October 13, 2019. August 11 through Sunday of Columbus Day Weekend: your “Return Pass” is valid through December 21, 2019. November 16 through December 21: your “Return Pass” is valid through July 31, 2020. “Return Passes” are not issued during our Silly Spooky Halloween event. “Return Passes” are not issued or accepted during our New Year’s Eve Partybration event. Unlimited visits for the entire 2019 season through mid December 2019. Children ages 1, 2, and 3 are free. To purchase a 2019 ‘Tis the Season Pass online now, OR to purchase 2019 General Admission day passes online now, click here. All ‘Tis The Season Pass Holders must present their passes at the entrance for admission. All ‘Tis The Season Pass Holders ages 13 or younger must be accompanied by an adult age 18 or older. If a ‘Tis The Season Pass is lost, there will be a $20 replacement fee. Each ‘Tis The Season Pass is valid only for one person and is non-transferable; those presenting a Season Pass for admission may be asked for additional photo identification. In the event of inclement weather, ‘Tis The Season Pass Holders are not eligible for a “Rein-Check”. Any Pass Holder found violating Santa’s Village safety policies, or exhibiting improper behavior while visiting, will be asked to leave the park. This could result in having the ‘Tis The Season Pass confiscated. Admission to the New Year’s Eve Partybration special event on December 31 is NOT included with a ‘Tis the Season Pass. Anyone wishing to attend the New Year’s Eve special event must purchase a separate New Year’s Eve special event admission ticket online in advance of the event while they last. For more information and additional benefits included with a season pass, click here. Visit Santa for two consecutive days and save! For those who want to take advantage of these tickets, please tell our Helper at the Ticket Booth. You will be issued a two-day pass at a savings of $5 per person; children ages three and younger are free. This option is not available during our Guest Appreciation Days. To purchase 2019 Two-Day Tickets online now, OR to purchase 2019 General Admission day passes online now, click here. 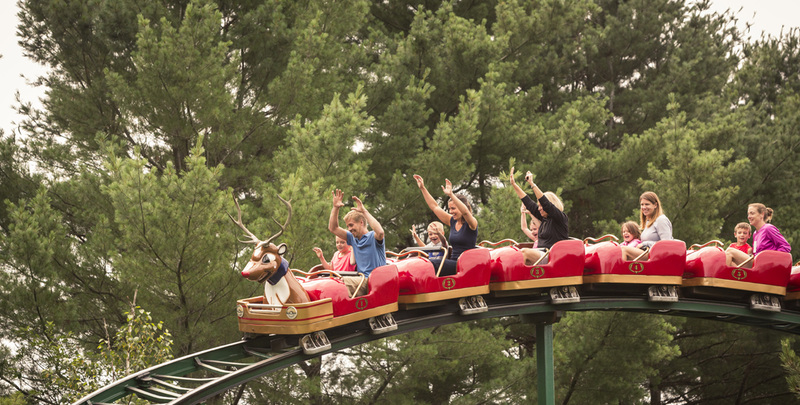 Visit Santa on one of our 2019 Guest Appreciation Days on May 25, May 26, June 1, June 2, June 8, or June 9 and save $5 per person off the daily rate of $34! For those who want to take advantage of these tickets, you may purchase your admission at the Ticket Booth on any one these dates, or buy Guest Appreciation Days tickets online. As always, children ages three and younger are free. Guest Appreciation Days are a great way to save, while making a visit to Santa’s Village before your summer gets too hectic. To purchase 2019 Guest Appreciation Days Tickets online now, OR to purchase 2019 General Admission day passes online now, click here.